October | 2008 | Knit & Run! October 2008 – Knit & Run! A picture’s supposed to be worth a thousand words (and I tend to run on when I’m talking baseball), but these pictures say it all for me. Yes, a picture is worth a thousand words, but these pictures are Priceless. Thank you, Phillies, for giving this to Philadelphia and all us fans. Can’t wait to see the 3 new banners at Citizens Bank Park next season, and the Phestival and Baseball 101 when we can all check out your new hardware!! There are days when you fully grasp the realization that you’re blessed beyond measure, and this weekend, I lived that for three whole days. On Friday night I won 2nd place in NJRW’s writing contest, Put Your Heart in a Book. Even more fun than that was when my name was announced and all my Valley Forge Romance Writers sisters in attendance cheered loud enough to shake the chandeliers. I had no idea they’d been planning on doing that, and I’m relieved they weren’t asked to leave for unruly behavior. 🙂 When I placed second, they cheered again. I can’t begin to describe how special that was. I couldn’t cry because I was so stunned to begin with. Thank you! The whole conference was just awesome. Robin sold out of “Romeo, Romeo” at the book fair, Judi was given a plaque in recognition of her first (and triple) sale, and the workshops and speakers were phenomenal. Virginia Kantra’s “Roman Women” story is going to turn my entire life around! JR Ward impressed the beep out of me. I learned something from every workshop I attended, and if I could’ve attended all of them, imagine how much better a writer I’d be! After the riotous party, Laura and I managed (just barely) to stay awake on Saturday night/Sunday morning to watch Game 3 when the Phillies gave up a 4-1 lead to come back and win, 5-4, in the bottom of the 9th at about 1:37 a.m. We still managed to lie there BSing for another half hour ’til we were both practically unconscious, but man, did we have a great time. There’s NOTHING like Girl Talk. And Laura, HAPPY BIRTHDAY tomorrow!!! You’re the funnest roommate (and co-enabler) ever!!! I am crazy in love with the awesome tote bag you made me, and I love ya, lady!! Thank You, God, for the gift of this weekend. How I earned it, I’ll never know, but Thank You. And don’t forget that Adele’s “Desert Heat” releases November 5th, the same day we close on our house! For both our sakes, I hope that’s not the same day as the Victory Parade (not to jinx it; I’m just saying) because I’ll really have a hard time deciding which to go to. The closing or the parade…? Hmmm. Right now it’s a toss-up. On the other hand, if they win in 4, I’ll gladly take time off next week to be there on Broad Street! Folks at my office are all decked out in their Phillies red today, and it’s wicked cool. Everybody’s excited beyond words for tonight’s game. Being a born-and-raised Yankees fan but an adopted Phillies fan, I’m used to late October baseball but nothing like this. There’s an energy in the air I can’t begin to describe. All I can think is that this must be what it’s like when you’re going to the Prom. I’m leaving early on Friday and I doubt, between the Series tonight and my nerves tomorrow, that I’ll be coherent enough to post anything between now and the awards ceremony, so please, wish us both luck. If I don’t win, I think I’ll be fine with that, so long as the Phillies come home with the World Series trophy. It’s been a long, wonderful, exciting ride for all of us, and be it my finaling or their NL Pennant, that’s an honor that nothing can ever erase. 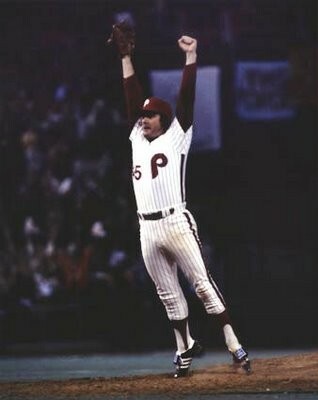 Congratulations to the Philadelphia Phillies and all us Phillies fans! Was that an awesome NLCS series or what? No matter what else happens next–and I won’t make any predictions, because the Sox and the Rays are both worthy adversaries–the Phillies are the National League Champions for 2008, and NOTHING can take that away! I wanted to share this just because I’m SO excited for Judi. 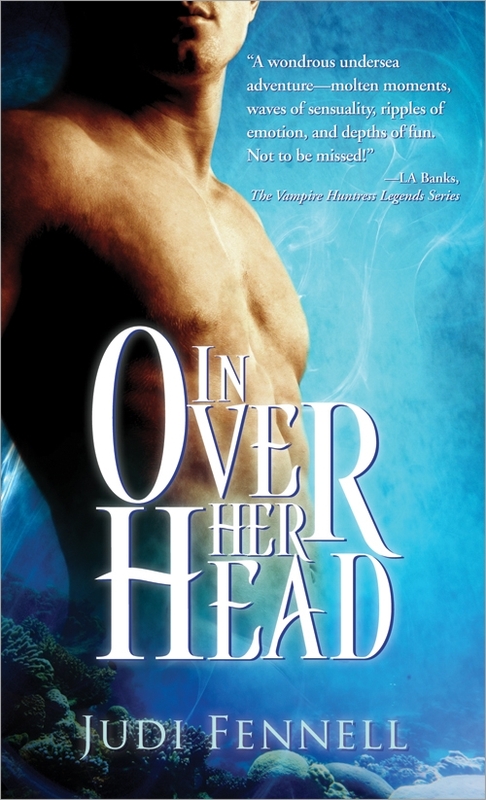 My friend and chapter prez, Judi Fennell, just got the cover for her first book, “In Over Her Head”, to be released next June, and I really have to say, while they did a fantastic job on Robin Kaye’s cover for “Romeo, Romeo” (due out November 2009), Sourcebooks outdid themselves with this cover. Only problem is, I got a little too excited and posted the cover before Judi and Sourcebooks had a chance to officially release it, so I’m afraid I have to take it down for now. Believe me, when I can, I’ll post it again because they did a really spectacular job. The nice thing is that it got me excited to think about what my first cover will look like. (Yes, I said “will” not “might”.) I can already see it in my mind. Maybe the backdrop is the scoreboard at Citizens Bank Park. Rich, emerald-green grass to one side. A broad-shouldered Paul stands with his baseball jersey half unbuttoned, a bat on one shoulder and Grace on the other. I don’t even see faces, even though I used Josh Holloway and Kelly Clarkson as my character models. All I know is, it’s perfect as it is. Right here in my imagination. But Judi’s cover isn’t in her imagination, and it’s awesome, in my opinion. Awesome! They picked a wonderful cover to go with a fantastic book! Way to go, Judi and Sourcebooks!